May 11, 2015. NREL and its subcontractor, SunSpec Alliance, have reached a critical milestone in the realm of public data to assess long-term system performance. SunSpec has successfully combined three formerly disparate databases into the new version of the Open Solar Performance and Reliability Clearinghouse (oSPARC). oSPARC currently boasts over 3,800 systems across 42 states representing 922 MW of system capacity. 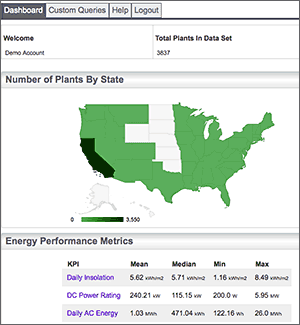 The new version includes an improved user interface as well as the long-term energy production from the California Solar Initiative, NREL’s PV Data Acquisition (PVDAQ), and the PVOutput databases. The database represents a powerful tool for investors, rating agencies, utilities, and federal and state policymakers to understand and assess the long-term system performance of PV systems across a wide array of geographic locations, module and inverter manufacturers, and other criteria critical for system design, investment, and load obligation. According to Michael Mendelsohn, Sr. Financial Analyst and project lead at NREL, “Through SunSpec’s effort over the past two years, we finally have a robust public database that is highly query-able that will greatly lift the veil of uncertainty over PV system performance in the field.” oSPARC is a project affiliated with the Solar Access to Public Capital (SAPC) working group dedicated to open capital market investment for solar deployment through contract standardization, best practices, investor and rating agency engagement, and—with the evolution of oSPARC—the availability of quality data to instill investor confidence in the solar asset class.